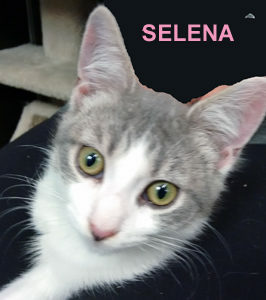 Selena and her 3 siblings were rescued in Ronkonkoma in April, 2018. They were named the “S” kittens, not only because their names begin with “S”, but also because they were, from the beginning, very Sweet. Selena came to PetSmart, Huntington, with her sister, Sally, who has been adopted recently. Selena is so sad and misses her sister. What would make her a happy kitten once again is finding a loving forever home of her own. This entry was posted in Adopted, Adopted Cats, Female, PetSmart - Huntington Station, Under 6 Months. Bookmark the permalink.